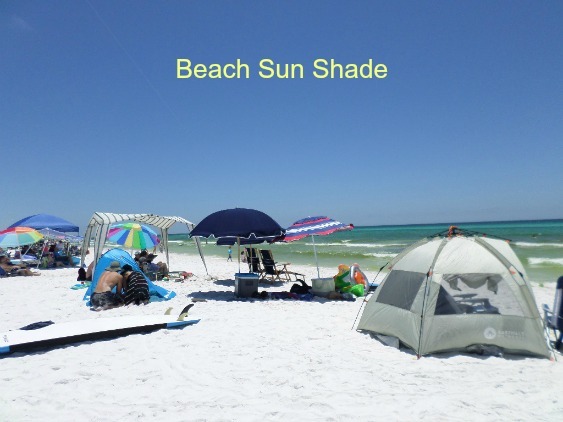 A beach canopy, tent, cabana or umbrella is a necessary item for any beach vacation and any of them provide beach sun shade. Unless it stays cloudy and rainy like it did on our last trip to the beach. 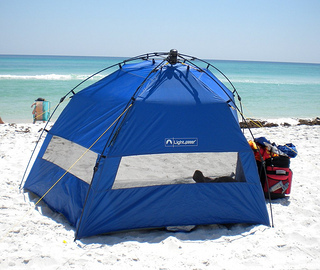 Fortunately there are lots of options that feature an easy set up like a pop up beach tent and sturdy wind resistant beach umbrellas. This piece of essential beach gear comes in many different sizes and styles. 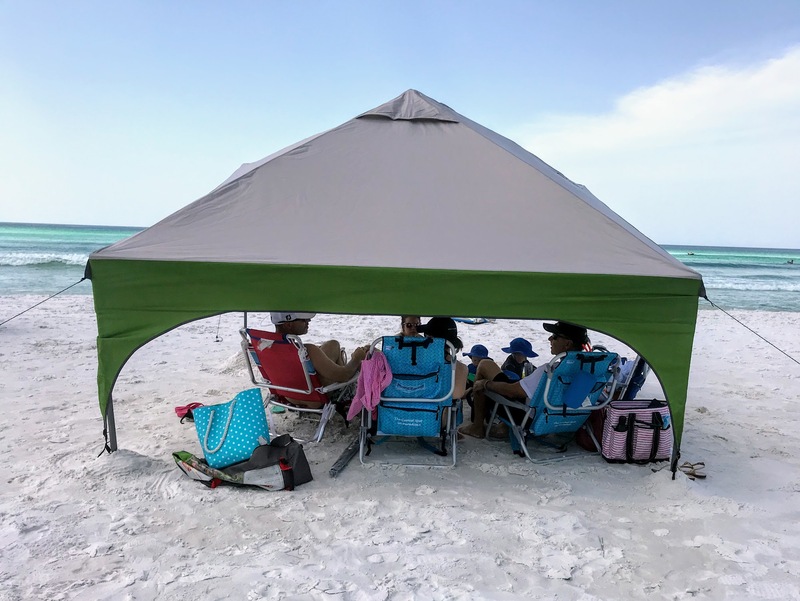 Some with umbrella poles that tilt and other beach sun shade options include tents with no bottoms so the kids can play in the sand while being protected from the sun. 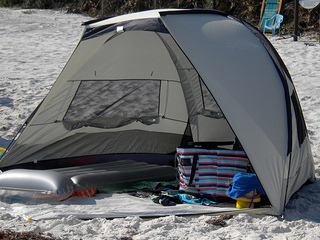 A pop up beach tent like this one is easy and quick to put up and take down. Ropes and a sand anchor keep it firmly in place. Nice big screens provide air flow and visibility. A beach cabana tent like this one serves as more than a sun shelter. If it is windy out it provides a quiet place to get out of the wind and blowing sand. Or if a brief shower pops up, which they often do in the summer in Florida, just wait it out instead of packing up and leaving. 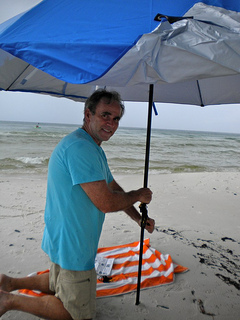 Looking for a large beach umbrella that can accommodate more than one person along with your cooler, toys, and towels? We love the size of this beach canopy as well as how easy and quick it is to set up and take down. 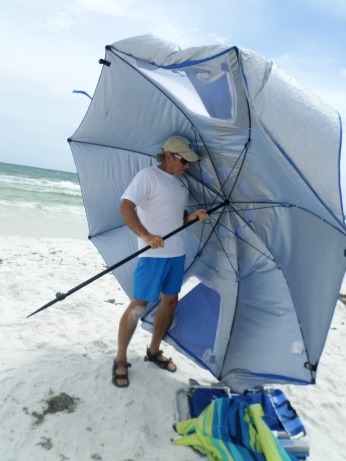 It can be used as an umbrella or as a beach sun shelter. Easy and quick to set up, sturdy even on windy days, and inexpensive. We pack it with us on every trip. 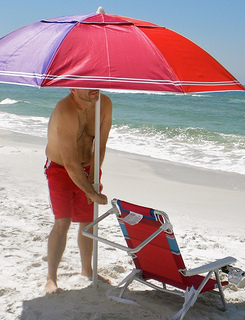 A portable beach umbrella with a tilt option provides shade all day as the sun moves. Screw it into the sand with a sand anchor - some umbrellas come with one and others don't. A vent at the top helps to stabilize it on a windy day. Add an umbrella hook to the pole to hang all your valuables, beach bags, towels or cover ups. Beach canopy tents accommodate a large group of people whether it's family or a group of friends. New designs make them easy to set up and take down - but it's usually helpful to have at least two people helping. Vented tops and staked poles prevent them from blowing away. An add-on side curtain provides extra protection from wind or sun. 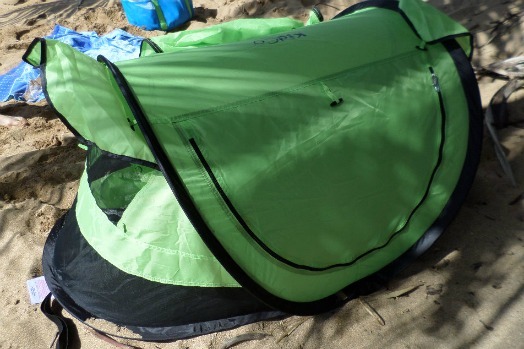 A baby's skin needs to be protected from harsh sun by some type of beach tent. Sunscreen should not be used on babies so shade is essential to protect them from ultraviolet light and from overheating. Be sure to keep them hydrated as well with regular feedings and water. It's not uncommon for there to be lots of wind by the ocean. The tent can be used for feedings, nap time or just to play in. 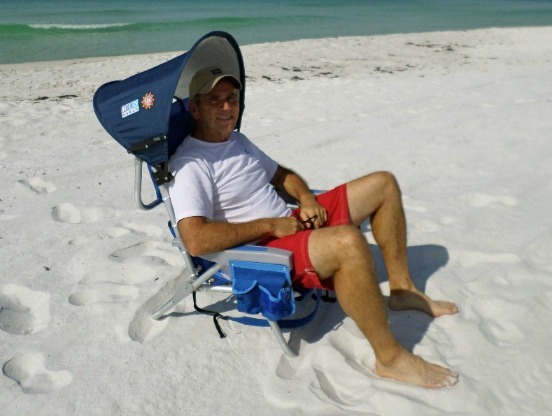 Attach a canopy or clamp on beach umbrella to your chair and you can move your chair all around from sitting in the water to your back to the sun or to sit close to a friend to catch up on some conversation.